Rupees are the currency used in Zelda Breath of The Wild. They’re really hard to get, and you’ll need a whole lot of them. Armor is expensive, housing even more so. If you just sell the stuff you find, the steady trickle of money won’t cover your needs. Thankfully, we’ve found a great way to farm rupees. In this guide, we’re going to show you how to make money in Zelda Breath of The Wild. The best way to make money is to visit a certain gambling den. It’s located in Lurelin Village, in the southeast of the East Necluda region (west of the Necluda sea). Once there, look for a house across the road from the merchant. It’s the one with jewels on the board above the door. Inside, you’ll find a suspicious bald character and three chests. He’ll let you play what amounts to a shell game. Choose the 100 rupees option. If you at least return your investment, continue playing. If you don’t, reload and try again. The results are random – there’s no way to know where the money will be, but the rounds are pretty quick. We made about 3000 rupees in 20 minutes, but have heard of others with even better luck. It’s boring, and it can be a pain, but if it’s money you’re looking for, this is the way to get it. If you’re into bowling, you can try snow bowling as a way to make money in Zelda BoTW. Travel to Hebra Tower, at the foot of Hebra mountain in the northwestern corner of the map. Just a bit northeast from the tower, you’ll see a cottage called Pondo’s Lodge. Talk to the man in front. He’ll offer you a chance to bowl with his giant snowball, but you’ll have to pay 20 rupees per try. Use the stasis power to launch the snowball. If you manage to take down all the pins with your first throw, you’ll earn 300 rupees. According to our reader Matt, the climbing game you can find north of Death Mountain, in the northeastern part of the map, is an amazing way to make money. The game requires you to climb up a cliff and collect as much rupees as you can in under 3 minutes. For the best results, you’ll need to come prepared – get the complete Climbing Gear and make sure you have enough stamina. You can swap hearts for stamina for this occasion – the investment is worth it. If you get all the rupees on the cliff, you’ll end up with a net profit of 750. We haven’t tried it out, but it sounds like a great way to earn money – although you can’t rely on it early on. Very helpful, got the game yesterday and I found a house for sale that I wanted to get so I looked this up! Yeah, there’s actually a 50/50 chance of getting it on the gambling once you get it the first time. I found that once you get the rupies from one chest, it can’t be the same chest. Maybe I just got a crazy streak but I got 9 in a row by doing that. Lucky me, i hit the green rupee 15 times in a row.. What are the odds of that? (2/3)^15, about 0.2%. That’s assuming that there isn’t some kind of pattern and every chest has the same probability. Go moose hunting north of snowfield stable in the northwest. Just make sure you collect the meat quickly or it’ll freeze. Cook 5 gourmet meat in the pot and sell to Beetle for nearly 500 Rupees. Made 6k in an hour. There’s a guy in outskirt stable that will buy raw gourmet meat for 100 rupees each. He’ll only buy three per day though, so don’t hedge all your bets on him. If you do this riding the giant horse it is very efficient. just ride back and forth ramming into them. Moose and wolves only take one hit, Rhinos take 2, so I just ram and hit them with a weapon I don’t care about breaking. The best way is a quest after you do the divine beast in zora domain, there is a zora that needs 10 luminous stones to repair the city with, he gives you two diamonds the first time and 1 diamond per 10 stones. Rusheroo actually its better to sell 10 of those stones by themselves rather than to give it to him in place of a diamond. 1 luminant stone is 70 rupees, that’s 700 rupees for 10 of them, 1 diamond is 500 rupees. As for the bowling game, the first time you get a strike he gives you a blizzard rod. Also, instead of wasting your weapon’s durability with stasis (nothing moves the snowball except weapon strikes) throw it along the right hand side of the path, the best way I can describe it is to throw the ball into the little pocket of hills, after a few tries you’ll find the spot I’m talking about. You’ll get a strike the majority of the time. You can pick up the snow balls instead of stasis. Best rupee farming spot I have surpasses the gambling game by far. North of death mountain is the super gut climbing game. You have to complete the gut check before you can do the more difficult and much more profitable version. You pay 100 rupees to play. You have to climb to the top of the hill in under three minutes while collecting at least 300 rupees. Get 300 by the time you reach the top, and you have a nice little 200 rupee income in roughly 4 minutes with talking. There are so many more to get on the mountain though. Get the full climbers set, upgrade all pieces to level 2, and I would suggest at least 2.5 max stamina bars. I have just one upgrade under a full 3. 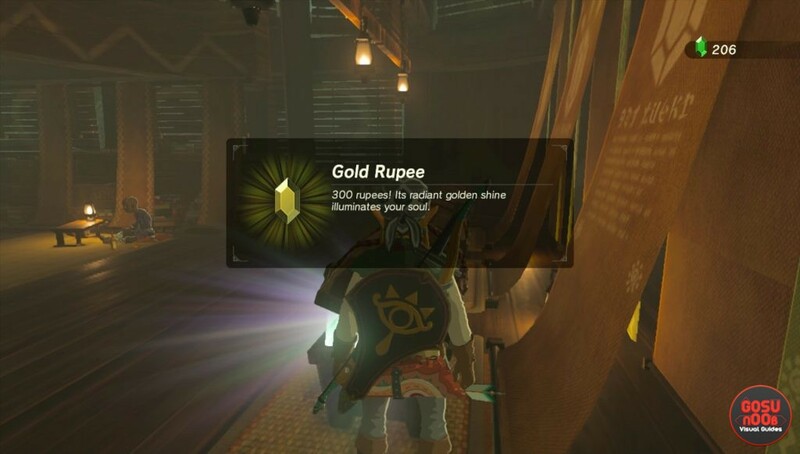 With that you can collect nearly every rupee on the cliff face in under 3 minutes, which is a bit more than 850 rupees. That’s a guaranteed income of 750 rupees every 5 (taking into account the time it takes to talk to the dude, and I’m being generous) minutes max. Takes a little preparation, and you might have to temporarily switch some hearts to stamina bars if you don’t have enough, but the payout is huge, and easy once you figure out a path for yourself. Wait, if it’s random, then there’s a 1/3 chance you’ll break even. Ignoring that, there’s a 50/50 chance you’ll either lose 100 rupees or gain 300. Shouldn’t you be able to be profitable in this game even without reloading? Two out of the three chests contain 1 rupee, only one contains 300 rupees, for an average gain of only 2/300ths of a rupee per round. So technically you’re right, over tens of thousands of trials you’d statistically come out on top, but it’s clearly only worth the time if you reload saves upon failure. Once you’ve managed to make it to the Goron and Rito cities, there’s a miniquest you can exploit for additional rupee farming. Northeast of the Plateau is a big mountain (Satori Mountain) with a bunch of copses of trees and herbs, great for starting out – including an entire orchard of apple trees. Bombing/Collecting the apples nets you about 70-80 of the things; take all of them to Goron City, and 10 at a time, dump them on the ground. Once they turn into Baked Apples, warp to the Rito City and climb to near the top by the Elder. A woman sits there from morning til night, and every 50 Baked Apples, she rewards you with 500 rupees. It’s definitely more “grindy” than other ways, but the repeated trips to Satori Mountain can net you big gains in various mushrooms, plants, and ore, as well as Blupee farming if you’re good with a bow. I got Gold Rupees 5-times in a row!!! What luck. I’ve found a really solid way of making money is to kill Stone Talus once every blood moon. There’s one on the Great Plateau and one on either side of the dueling peaks, and all you need is a sledgehammer. You get about 6 amber, 4 flint and 4 other assorted gems per Talus you kill, more if you can get the rarer ones. 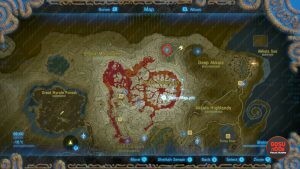 I only found 100 rupees on the island north east of Mount Lanayru. Actually the best way I’ve found of making Rupees is Mining, from both random ore deposits and Talus. On my way to Kakariko Village, I killed 2 Stone Talus (one on each peak of the Dueling Peaks, and mined a little of the ore deposits and when I got to the stables and sold the gemstones I had made a little over 4K Rupees. A quick, and fun way to make rupees is to warp to Ridgeland Tower and play the gliding minigame. You need a lot of stamina, but it works every time. Talk to the guy there, pay the 20 rupees and glide to the east through the canyon. You’ll always land far enough away to get paid 100 rupees. You do pay 20 rupees, but you will make a guaranteed 80 rupees every time you glide, and you can do it pretty quickly.